I'm not going to pretend I was a huge 32 Leaves fan. I really liked their song "All Is Numb," but I didn't really listen to much of their other material. I may have listened to Welcome To The Fall, their debut, once or twice, but with those few listens I never became a die-hard fan. Nor will I pretend I was devastated by the band's breakup. When they split a few months after an apparently disappointing Panoramic (I wouldn't know), I was mildly disgruntled for a few minutes before shutting down my computer, doing something else, and forgetting 32 Leaves was no more. I also won't pretend I was immediately filled with excitement when lead singer Greg Norris announced the formation of his new band, Codec, and released the band's debut album less than a year later. Rather than eagerly snap up every single Codec released on the way to the album, I found out Norris had a new project through a Facebook ad a few weeks ago, months after the release. A bit skeptical, I listened to the new material, almost as late to the party as I had been upon discovering his former band. I don't need to pretend, however, that Horizontime is a solid album. It's a shockingly impressive and elaborate album, especially considering the stagnant nature of its genre of alt-metal. 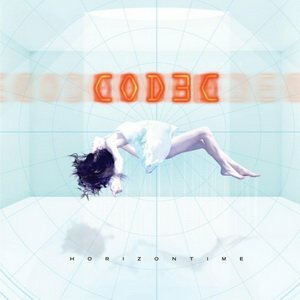 Codec takes some of the best elements from genre stalwarts like Red and Chevelle, tones down the distortion a tad and throws in some art-rock stylings a la Tool. The result is a release which stays far away from most of the cliches associated with the style. Lead single and opener "Bifurcate" demonstrates this fusion well, with its tuned-down power chords and simple verse-chorus format. What make it more interesting than the genre's standard-fare songs, though, are its choruses and bridge, throwing non-standard vocal harmonization, cleaner guitars, and odd time signatures into the mix. This unorthodox song-crafting is what makes Horizontime so appealing - rather than chug along at radio-friendly pace for 10 or 11 songs, the album is a full-fledged and fully-concepted release, and oddly enough it actually feels complete. Norris' excellent vocals add to the allure, as they are both immediately appealing thanks to their purity and cleanliness and lasting due to the fact that Norris doesn't give the impression he's the dime-a-dozen alt-metal singer which tends to be the norm. It's also somewhat shocking that Codec's slower pieces are excellent. The acoustic guitar and foggy vocals of "Daydreamer" complement each other quite well, the vocals in the chorus are nothing short of excellent, and the trance-like nature of the whole song works far better than most trashy alt-metal quasi-ballads which would most likely be an easier route. That's not to say Horizontime is a perfect album, though. For one, the songs here tend to blend into each other after a while - the dreamy nature of the release veers a little too close to homogeneous at times, and much of the album treads in similar territory. Also (and this may be me just being a bit dense), though it's been made clear this is a concept album, the story behind the songs is a bit lost on me. The lyrical quality doesn't help this confusion, as they come off as the one stereotypical element in the whole endeavor, making it that much more difficult to find a coherent storyline to hang on to throughout the album. However, these are only minor criticisms keeping Horizontime from being an utterly perfect album, and in general it succeeds greatly. I have no need to pretend I'm a supporter of Codec - Horizontime is all the convincing I need to be a true fan.